April 2016 issue on sale now! | What Hi-Fi? April 2016 issue on sale now! 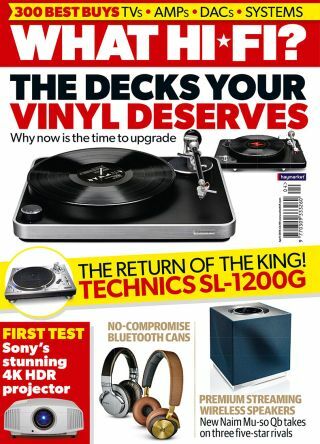 A £1000 turntable head to head, a premium wireless speaker group test, a first look at Technics’ new SL-1200G turntable and Sony’s first 4K HDR projector make April 2016 an issue not to be missed. A £500 entry-level turntable may be fine for your first foray into vinyl or if you’re on a tight budget, but really to get the best from your records you should be looking to spend nearer the £1000 mark. We’ve taken the multi-Award-winning Clearaudio Concept and pitted it against a newcomer from Pro-Ject. Can the king reign supreme? We’ve long stuck with the theory that wired headphones sound better than their wireless counterparts. But with technology improving all the time that isn’t necessarily the case any longer, as some of the pairs in our wireless headphone group test prove. Sennheiser’s Award winning Momentum 2.0 Wireless go up against six big-name rivals. It’s not only wireless headphones that have a place in the modern hi-fi enthusiast’s repertoire - premium wireless speakers are doing their utmost to replace the traditional two-channel stereo system. We’ve put four models from Dali, Naim, B&W and Geneva on test to see if any can take pride of place as your primary source of music. Turntable fanatics, aspiring DJs and audiophiles alike got all excited when Technics announced two new versions of its iconic SL-1200 deck. The new models, one limited and one regular edition, were shown in all their glory at CES 2016. We were fortunate enough to get a closer inspection at the show and have put down our thoughts in this months’ Insider. Our Temptations section this month features a £5500 entry-level CD player from Metronome and a £4000 stereo amplifier from Unison Research. Does either manage to justify its price tag? And no issue of What Hi-Fi? would be complete without a First Tests section. This month we’ve got Sony’s new flagship 4K projector - which also happens to be the first in the world to support HDR content - and an intuitively designed soundbase from Philips. There’s also an Onkyo network system and the Motorola Moto X Force smartphone with shatterproof screen. And don’t forget, you can download the digital edition of the magazine directly to your smartphone or tablet at any time. Happy reading!